1:14 a.m. — Officers investigated to a possible domestic disturbance in the 200 block of Orange Street. 8 a.m. — Police and fire department personnel responded to a gas lead on Portland Way North near Heise Park Lane. 11:33 a.m. — A resident in the 1200 block of Dawsett Avenue called to report his dog had been attacked by a neighbor’s dog. A few minutes later, a call from the same address reported a man had collapsed and was having trouble breathing. He was transported to Galion Community Hospital. 12:31 p.m. — A call from the 700 block of Street reported a bald man, wearing a gray t-shirt, green pants and flip flops was trying to break into a car, and after being yelled at got in the back of a silver pick up and fled the scene. 1:17 p.m. — Police responded to a car crash in the 200 block of Pershing Ave. A man was cited for failing to yield on while making a left-hand turn. 1:44 p.m — A resident in the 500 block of McDonald Avenue told police her dogs had been attracted to a doughnut in a tree and it smelled really bad. She wanted police to know in case it had something to do with dogs ingesting poison in the area. 2:02 p.m. — A South Pierce resident reported being touched inappropriately by someone at the residence. She decided not to file a report. 2:55 p.m. — Police investigated a verbal dispute at a business in the 1300 block of Harding Way East. 3:49 p.m. — A man reported his son found a gun under some pushes in the 600 block of South Market Street. It turned out to be a pellet gun. 4:34 p.m. — A girl’s pink and purple bike was found on the corner of South Boston Street and Grove Avenue. It was taken to the police department. 6:51 p.m. — A shoplifter was reported at Circle K on East Street. 10:24 p.m. — A report of someone being threatened was taken in the 200 block of Orange Street. 2:31 a.m. — A resident in the 200 block of Grant Street reported someone rang the door bell and was on their porch. 5:56 a.m. — A dead dog, with a bloated stomach, was reported in the 200 block of West. Summit St.
8:43 a.m. — A semi truck was stopped driving through the parking lot at Galion Middle School and given instructions on how to get out of the lot. More than a dozen similar calls were recorded by the police department during the day. Several citations or warnings were given for driving on closed roads, for trucks not using the right detour and other similar actions. 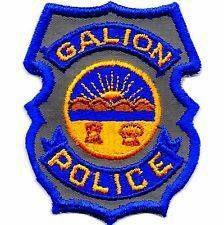 10:27 a.m. — Police investigated a possible assault in the 100 block of Fortney Avenue after receiving a report from a Galion Community Hospital physician. 10:48 a.m. — A worker at Goodwill on Carter Drive reported that a big box had dumped a bunch of trash at the store. 4:30 p.m. — A truck window was reported in the 300 block of Harding Way West. 7:54 p.m. — A lost child in the area of Grove Avenue and Boston Street was returned to its mother. 8:43 a.m. — Officers assisted a truck driver with an oversized load get to his route. 9:59 a.m. — A Cherry Lane resident reported his shed broken into and a weed eater stolen. 11:23 a.m. — A report of a subject riding a minibike in the street on Lawn Ave was investigated. The subject was gone upon officer’s arrival. 11:54 a.m. — Officers assisted probation officers in the 200 block of E. Mary St.
12:52 p.m. — A report of a subject riding a minibike in the street on W Mansfield was investigated. The subject was gone upon officer’s arrival. 1:10 p.m. — Officers investigated a traffic accident at Poplar and Mansfield streets. 3:12 p.m. — A report of a theft of food was investigated. 3:176 p.m. — A report of a fire alarm in the 900 block of S. East St. was investigated. 3:19 p.m. — A report of backed up traffic on S. Sandusky was investigated. 3:45 p.m. — Officers delivered a message in the 400 block of Norton Way. 4:01 p.m. — A report of a stolen mini bike in the Waterford Glen area was investigated. 4:35 p.m. — Officers picked up three oxygen tanks left in the 200 block of N. Sandusky Ave.
5:05 p.m. — A report of a dog bite in the 400 block of E. Rensselaer St. was investigated. 5:08 p.m. — Officers assisted EMS in the 400 block of E. Rensselaer St.
6:40 p.m. — Officers meditated a domestic issue in the 800 block of Woodale St.
6:55 p.m. — Officers assisted a male having some emotional issues. 7:47 p.m. — A report of a possible breaking and entering in the 300 block of Wiley St. was investigated. 8:33 a.m. — A report of a vehicle entered last Monday in the 600 block of E Mary St was taken. A camera and some change were reported missing. 8:39 a.m. — A S Poplar St. resident reported his vehicle vandalized while parked at his residence overnight. 9:07 a.m. — A minor accident report was taken in the 600 block of Virginia Ave.
10:13 a.m. — Officers investigated a disturbance in the area of Waterford Glen. 11:49 a.m. — A possible fraud was reported at the Police Department. 1:09 p.m. — A noise complaint was investigated in the 500 block of W. Rensselaer St.
2:10 p.m. — Brian m. — Johnson, 56, was arrested on Woodbine St. on charges of Domestic Violence. He was transported to Crawford County Justice Center to be held for court. 3:39 p.m. — A vandalism report was taken on Earl St.
3:54 p.m. — Officers assisted Life Support Team in the 900 block of Whetstone St.
4:09 p.m. — A 911 open line call was investigated in the 1200 block of Lynne Av. 4:28 p.m. — A domestic dispute was investigated in the 200 block of Blicke St.
6:42 p.m. — A blue “Frozen” bicycle was reported stolen in the 400 block of E. Charles St.
7:56 p.m. — A bicycle abandoned on N. Spring St. was brought the Police Department.